This charming box has been painted by talented Fedoskino artist Semeonova Svetlana. 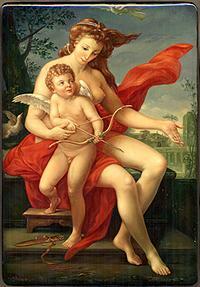 It depicts a cupid sitting on legs of Venus and ready to send an arrow from a bow. "Venus and Cupid" originally was painted in 1785 by Italian artist Pompeo Gerolamo Batoni(1708-1787).Oil-on-canvas is located in Arkhangelsk Cathedral Museum, Moscow, Russia. The scene is painted in light green, gray, white and brown oils. The box is constructed from paper-mache. Black lacquer is used to paint the exterior of the box while red lacquer completes the interior of the work. The box's sides are decorated withe intricate gold flower pattern. The lid is hinged to the left of the scene, and the box rests on a flat bottom. The work is signed with the artist's name, Fedoskino and dated 1998.